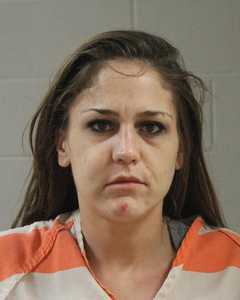 WASHINGTON CITY — Washington County Drug Task Force agents busted a 23-year-old Washington City woman for possession of heroin with the intent to distribute, evidence tampering, and possession of drugs and paraphernalia Sunday after serving a narcotics search warrant at her residence. At 2:10 a.m., the Washington County Drug Task Force located Abigail Gibson in her home and placed her under arrest on two warrants. The first warrant was for no proof of insurance, a class B misdemeanor; speeding and no valid driver’s license, both class C misdemeanors. The second warrant was for possession or use of a controlled substance, a third-degree felony; and possession or use of drug paraphernalia, a class B misdemeanor. During the search warrant, detectives located a plastic container with five balls of heroin and alprazolam pills in Gibson’s downstairs bathroom, according to the probable cause statement filed in support of the arrest. In the toilet, detectives located tinfoil covered with brown residue, according to the statement. Gibson said in an interview after her arrest that she attempted to flush the tinfoil, containing what appeared to be heroin, down the toilet. The drug charges brought against Gibson were enhanced to drug possession within a drug-free zone because her location is within 1,000 feet, or 700 feet by Google maps, of the daycare facility at the Washington City Community Center. Gibson was booked into the Purgatory Correctional Facility on the warrant charges, possession of a controlled substance with intent to distribute, a first-degree felony; distribution of a controlled substance within a drug-free zone, use or possession of drug paraphernalia, and obstructing justice, all of which are class A misdemeanors. Her bail is set at $25,000. She made her initial appearance in Washington County 5th District Court Monday and is scheduled to counsel with an attorney regarding her case on Monday. Gibson remains in custody at the time of this publication, according to booking information. Isn’t it amazing what these cops can do when they don’t focus their entire force on busting up a dance party? Arm chair QB’n it again koolaid? This girl needs help not jail time…. instead of focusing on this small time drug addicts they should be focusing on the Mexican drug cartels and we should pull out of Afghanistan the number 1 opium supply of the world and guess who’s controlling it? That’s right the United States of America, they don’t really want us to stop using drugs they just want to make it seem like that’s what they want if they wanted us to stop they would decriminalize it build free rehab centers and educate the use on what happens when you abused drugs but they don’t tell you that they tell you not to use it and that’s it, don’t do drugs its bad… So what are the kids do when they get upset and hate the world ,they go use drugs like a bad kid and then they get addicted, I blame the United States government. Now there is a woman with balls! Balls of heroin I mean. Romeo. Maybe it is time to look at your self and what you are doing instead of blaming others for your woes. bad boys bad boys what cha gonna do. nice work.